An undergraduate degree in education from an accredited college or university. Individuals with other degrees may be accepted at the discretion of the director of graduate studies. An undergraduate GPA of 3.00 or an average of at least 3.00 for no fewer than nine semester hours of graduate credit at an accredited graduate institution. If students do not have a 3.00 undergraduate GPA, students may be accepted into the program on probation. An official transcript of undergraduate and graduate work. 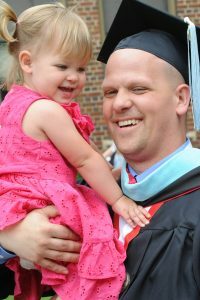 A written statement in which the applicant describes his or her views of education, teaching, or ministry as well as his or her goals for the graduate program. International Students for Whom English Is a Second Language: Students must provide evidence of English proficiency by submitting a recent (two years or newer) Test of English as a Foreign Language (TOEFL) or International English Language Testing System (IELTS). Master of Arts in Theological Studies only: An undergraduate degree from an accredited college or university and completion of the six undergraduate theology courses required for certification as a staff minister or teacher, or comparable undergraduate coursework approved by the graduate faculty. Students meeting the above academic guidelines are accepted into the program upon review and approval by the director of graduate studies. Students will be notified of acceptance via postal mail. Students may take up to nine hours of courses before applying for admission to the program. At the end of nine hours, students may apply for admission and up to nine credits may be applied to the program. Special student status is available for those students desiring to take a graduate course, but who do not desire to enter the graduate program. Special student status is open only to those persons who have an appropriate undergraduate degree from an accredited college or university or, in some special circumstances, Martin Luther College undergraduate students. Your completed application form may be printed and mailed to the postal address on the form OR saved, attached, and emailed to graduatestudies@mlc-wels.edu.